Foreign Minister Zarif accuses Mossad of working to scuttle Iran nuclear deal, shortly before new slate of US sanctions come into effect. 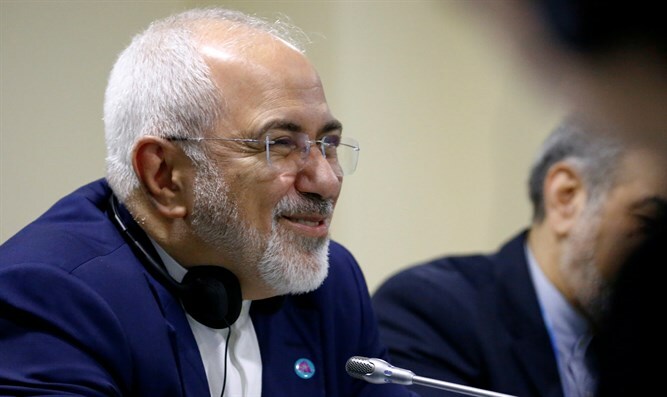 Iranian Foreign Minister Javad Zarif accused Israel's Mossad espionage agency of running a "program to kill the JCPOA" on Thursday, a few days before a new round of US sanctions will take effect. "Incredible series of coincidences. Or, a simple chronology of a MOSSAD program to kill the JCPOA," tweeted Zarif, along with a list of anti-Iranian actions taken by an assorted list of countries. The JCPOA, or Joint Comprehensive Plan Of Action, is the official name of 2015's nuclear deal with Iran. Zarif's tweet comes after reports which said that the Mossad aided Denmark in foiling a recent assassination attempt by Iranian agents. According to an Israeli official, the Mossad provided Danish security services with information which led to the arrest of a member of the suspected Iranian terror cell operating in Scandinavia. Prior to Samuelsen’s announcement on Tuesday, the head of Denmark's intelligence service PET, Finn Borch Andersen, said his agency believed the Iranian intelligence service "was planning an attack in Denmark" against three Iranians suspected of belonging to the Arab Struggle Movement for the Liberation of Ahvaz. A Norwegian of Iranian origin was arrested on October 21 for allegedly planning the attack and spying for Iran, according to the report. On Tuesday, Denmark announced that it had recalled its ambassador to Iran over its complicity in the attempted attack.